Like it or not, people just love to measure and compare and because of this, when it comes to avoiding metrics, you can run, but you can’t hide. In this article, I will offer you some suggestions as to what metrics actually matter when it comes to implementing Scrum. Good metric – Used as a signal to help the team identify roughly where things are at and more importantly, as a guide to help the team inspect and adapt its processes to improve over time. Evil metric – Used as an inflexible indicator for micro-managing an individual’s performance over time and more importantly, for ‘beating’ people up and killing morale. The sprint burndown is a forecasting metric to assist in tracking progress throughout the current sprint. For each day in a sprint, plot the sum of the ‘remaining times’ for all tasks in the sprint backlog. 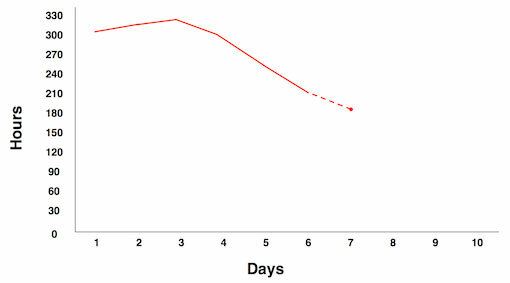 Figure 1 – A sprint burndown chart, updated on a daily basis. 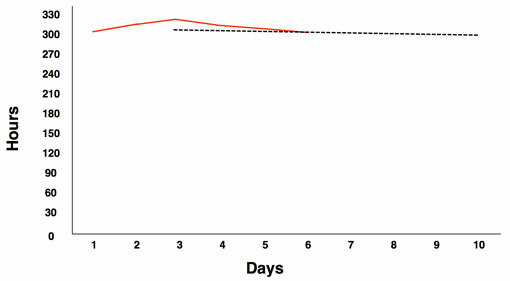 The sprint burndown is generated at the end of each day of a sprint (excluding the final day, which is dedicated to the sprint review, retrospective, and planning for the subsequent sprint). The sprint burndown metric acts as a daily gauge for the Scrum team to help manage its workflow and gauge progress. New tasks were added to the sprint backlog (that weren’t anticipated during sprint planning). Some of the task estimations were incorrect. Team members had taken some unplanned time off. Figure 2 – The team is clearly behind schedule; time to speak to the product owner about possibly decreasing scope. Of course, it is possible that all four factors had come into play causing the now expected delay. Following sprint planning, many teams will draw a straight, diagonal (theoretical) line from the top of the y-axis values to end of the x-axis values and this is used as a benchmark for the actual burndown line. I warn against using this approach as it can easily create an inaccurate perception of progress. The problem with this line is that sprint progress will rarely mirror the theoretical line on a day-to-day basis. Many sprint burndown lines will actually burn up for the first few days due to new discoveries before beginning it’s downward descent as the team gathers momentum. 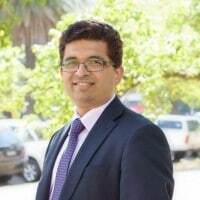 By including the theoretical line, a curious stakeholder may get the misleading impression that the team has fallen behind after only just one or two days. How can you act on it? If the sprint burndown clearly indicates that the team is not going to reach the sprint goal then apart from doing everything in your power to help remove any impediments, it should prompt a discussion with the product owner to assess whether any scope can be removed. If the slip is due to inaccurate estimating of tasks, it can be helpful to analyze why the estimates were wrong to try and improve the sprint planning accuracy for the next sprint. The team is clearly behind schedule; time to speak to the product owner about possibly decreasing scope. Sprint burndown charts can also paint a rosier picture (believe it or not) if they trend steeply towards an early completion of the sprint backlog. If this is the case, the burndown should prompt the product owner to prepare the next sprint-ready product backlog items for additional consumption prior to the forthcoming sprint planning session. Figure 3 – The team is clearly ahead of schedule; time to speak to the product owner about adding scope. 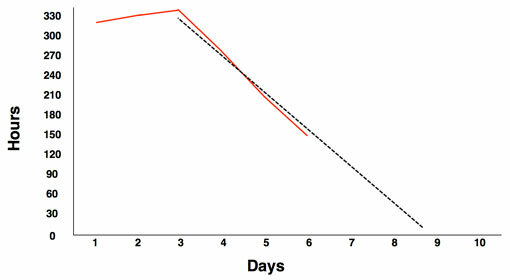 The enhanced release burndown is inspired by Mike Cohn’s ‘Alternative Scrum Release Burndown Chart’. For each sprint, plot the sum of the ‘remaining points’ for all product backlog items in the product backlog designated for the next release. Draw a trend line relating to the data points in step 1. For each sprint, plot (as negative y-axis values) the sum of the story points for any product backlog items added to the product backlog after the start of the project (if applicable). Draw another trend line that relates to the data points in step 3. The enhanced release burndown metric is generated at the end of every sprint. This metric signals what the development team’s rate of progress is relative to the scope’s rate of change. The point where the two trend lines (hopefully) intersect indicates roughly how many sprints will be required to complete the release. If the trend lines run parallel to each other (or diverge), it is an ominous indication that the release will theoretically never see the light of day. Figure 4 – An enhanced burndown chart, updated after each sprint. If the two trend lines do not intersect or the expected release duration is intolerable, then either the rate of progress needs to increase (by improving practices and / or removing impediments) or the scope needs to be reduced. Figure 5 – Ominous signs that this release might never see the light of day. Better improve practices, remove impediments, or decrease scope. Sprint interference is a productivity metric to assist teams with their sprint capacity planning. For each sprint, plot the sum of the time spent by any of the developers for any non-sprint backlog tasks. Draw a trend line that relates to the data points in step 1. Figure 6 – Be sure to note the trend in this graph to assist in estimating your team’s capacity at the next sprint planning session. Be sure to note the trend in this graph to assist in estimating your team’s capacity at the next sprint planning session. 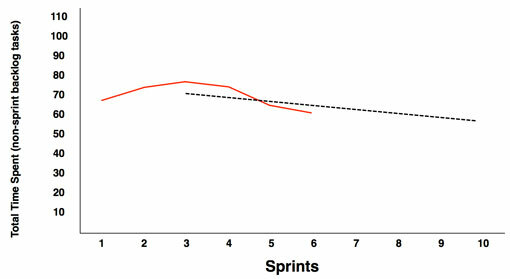 The sprint interference metric is generated during sprint planning. 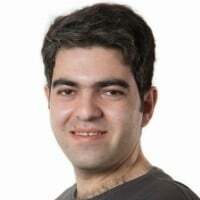 By providing visibility on the time spent handling historical sprint disruptions, this metric will help you to estimate the potential sprint capacity for the forthcoming sprint (the amount of time that the development team should allocate to sprint backlog tasks). This is especially helpful if you have adopted commitment-based sprint planning. In any given sprint, there will be a range of external organizational disruptions that simply can’t be avoided. This metric assists in quantifying these disruptions and can also indirectly help to identify what are unavoidable disruptions (such as company meetings) and what are avoidable impediments (such as constantly having to fix inadequate equipment). For each sprint, plot the sum of the points for all bug related work. Draw a trend line that relates to the data points in step 2. Figure 7 – This indicates that quality is improving. The effort spent on bug-fixing is going down while velocity remains consistent. The remedial focus metric is generated at the end of each sprint. This metric monitors the fluctuations in product quality by measuring the percentage of each sprint that is spent working on bugs as opposed to new functional requirements. Figure 8 – Even though velocity is increasing, it’s not all good news, as quality is decreasing. Time to revisit the definition of done. How can we act on it? If the time spent on bugs isn’t trending downwards, it is a clear indication that the level of inherent quality is insufficient. This should prompt the Scrum team to revisit the definition of done to tighten up the quality requirements. These four metrics form a small subset of the potential metrics that can be derived and utilized during a Scrum project. But be warned; incessantly generating metrics (just because you can), may cause you to contract an illness that Scrum on the whole tries to combat – analysis paralysis. Finally, it is vitally important to reinforce the point that metrics need to be handled with care and used for good and not for evil. Use metrics as signals to help your team improve their practices and definitely not for micro-managing and measuring individual performance. Find out more about Scrum related metrics by taking one of our CSM training courses. Scrum Master at Butterfly Just wanted to touch base and thank you guys for the amazing training you have been providing to our team. So far you have certified my entire team of ten developers and two digital producers. This has been great for Butterfly and we have improved our Agile practices significantly. Test Manager at Bureau of Meteorology I highly recommend the CSM course run by AxisAgile, I found the delivery of the course was extremely professional and the energy level was fantastic. Well done guys.